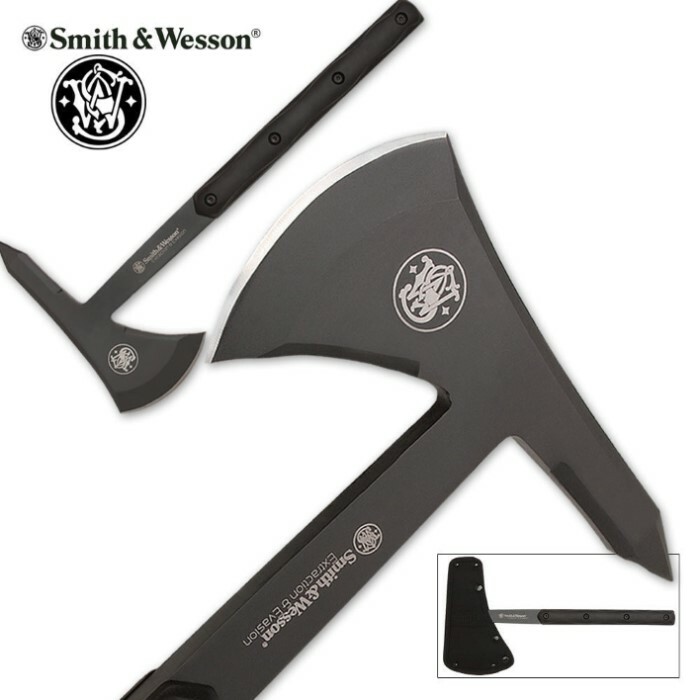 Hit hard and take control of any tactical situation with Smith & Wesson's rugged tomahawk. Forged using 1070 high carbon steel this beast is one solid piece of steel from end to end with Kraton handle panels. The steel is approximately 8mm thick and this piece weighs in at 2 lb 11 oz. Includes black nylon sheath. 15.9 in. overall with 3.9 in. blade and 10 in. handle. Smith and wesson. Made in china. Those done go together, but here it is. Its a great tomahawk, its tough, but the hand guards get sloppy and loose, not too enthralled there, but all in all, if you want a tomahawk to go through doors with, this is probably what id hand you. This thing is WICKED! One solid piece of steel, and the handle feels good single or double grip, it's also is comfortable if you choke up on it. It has good weight to create a lot of force. I would like to see a raised piece on top for jabbing/butting and some extra steel on the sides for hammering; nevertheless; a great buy.